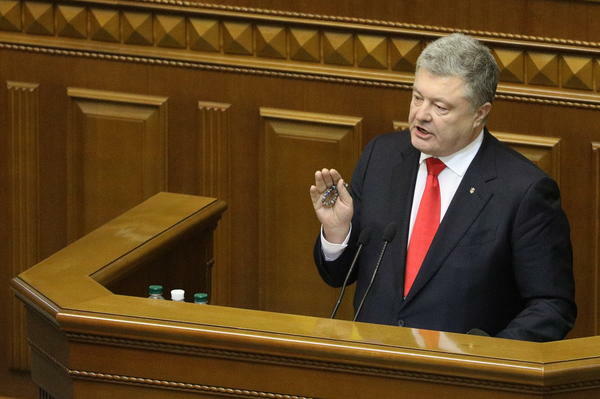 Ukrainian President Petro Poroshenko gestures during a parliament session in Kiev on Monday. Ukraine's parliament has agreed to impose martial law in 10 of its provinces to combat "growing aggression from Russia," after a weekend confrontation in waters off the disputed Crimean Peninsula led Russia to seize three Ukrainian navy vessels. After five hours of debate on Monday, parliament voted to support the motion proposed by President Petro Poroshenko to impose martial law for 30 days. Poroshenko told lawmakers that the special powers will only affect regions of Ukraine bordering Russia, Belarus and Moldova's "breakaway republic" of Trans-Dniester, which the president has identified as in the front-line of any potential Russian strike, according to the Associated Press. "Martial law will include a partial mobilization and strengthening of the country's air defense. The measures before parliament also included vaguely worded steps such as 'strengthening' anti-terrorism measures and 'information security,'" the AP reports. The Russian Foreign Ministry issued a statement on Monday with a "warning" to Ukraine that naval conflict in the Sea of Azov and the Black Sea "is fraught with serious consequences." 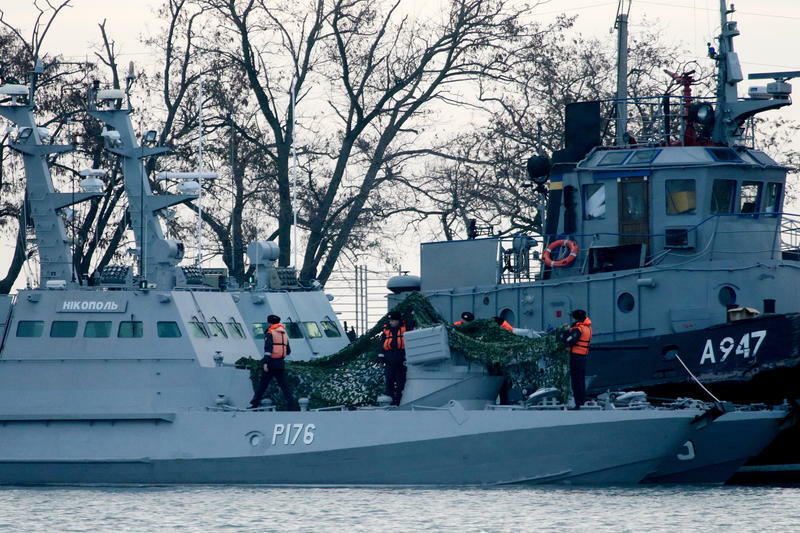 Sunday's incident occurred as the Ukrainian navy ships, including a tugboat, tried to pass through the Kerch Strait, a strategic waterway that separates the Black Sea and the Sea of Azov. A newly built Russian bridge opened by Putin himself now spans the strait, which Moscow hopes will solidify its claim to adjoining Crimea, the Ukrainian peninsula it forcibly annexed in 2014. The navy ship Berdyansk and Nikopol and the tug boat Yana Kapu were heading from the Black Sea port of Odessa to Mariupol in the Sea of Azov, Ukraine has said. Several Ukrainian sailors were injured in the incident — Ukraine officials say six were hurt; Russia says three. Volodymyr Yelchenko, Ukraine's ambassador to the United Nations, said his country has audio recordings of radio traffic that proves the Russian military orchestrated the incident. On Monday, Nikki Haley, the U.S. ambassador to the U.N., called the incident an "outrageous violation of sovereign Ukrainian territory" and "another reckless Russian escalation" during an emergency meeting of the U.N. Security Council. However, President Trump has not directly called out Russia's actions. "We do not like what's happening, either way, we don't like what's happening and hopefully it will get straightened out," he said on Monday, days ahead of another meeting with Putin at the G20 summit in Argentina. The European Union also issued a statement on Monday "urging all sides to act with utmost restraint." In a speech on Tuesday, German Foreign Minister Heiko Maas said Moscow must respect international law and territorial sovereignty. "The aim must be that Russia sticks to international rules again and that it does not violate the territorial sovereignty of its neighbors," he said. A 2003 treaty between Russia and Ukraine says the area is shared territorial waters and guarantees freedom of navigation. Russia has accused Poroshenko of instigating Sunday's naval incident, in which Russian vessels fired on, rammed and then seized three Ukrainian vessels, as a pretext for declaring martial law with the aim of delaying elections in March. "Clearly, this is a well-thought-out provocation that took place in a predetermined place and form," the Russian Foreign Ministry's Monday statement said. NATO Secretary-General Jens Stoltenberg said on Monday that Poroshenko assured him that martial law would be limited in scope. "He underlined that the introduction of martial law will not hinder the working of the democratic institutions of Ukraine, and will not create any problems for the upcoming presidential election," Stoltenberg said. "For NATO allies, this is of course important, that the president so clearly says that the martial law will not create any problems for the political democratic processes in Ukraine." Poroshenko originally proposed 60 days before halving the proposed period to 30 days. Three former Ukrainian presidents, including first president Leonid Kravchuk, opposed the motion. A letter signed by them said that the originally proposed length of 60 days would pose a "threat to democracy" by delaying the presidential election. Russia's Seizure Of Ukrainian Ships Is An 'Outrageous Violation,' Haley Says At U.N.
Russia's seizure of three Ukrainian naval vessels near Crimea is an "outrageous violation of sovereign Ukrainian territory," says U.S. Ambassador to the U.N. Nikki Haley, calling it "another reckless Russian escalation" in a deadly and years-long conflict.